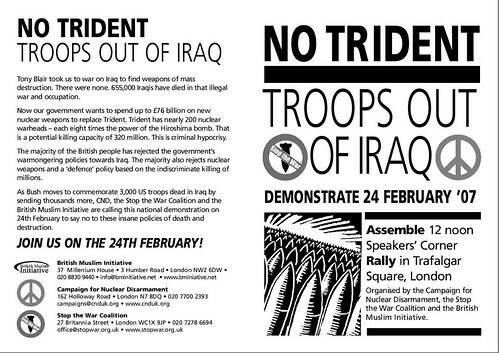 On Sat 24th Feb 2007, London hosted a large rally and protest against the war in Iraq, nuclear arms expansion and future attacks. The protest organised by the Stop The War Coalition was well attended and it was great to see so many people from so many communities and backgrounds present. Especially heartening was the large numbers of youngsters (young school kids and even babies in prams ;p) who came along and too active part in the protest. This group is for captures to do with and of the protest, it is not for general antiwar protests (there are many other groups around for that). Pictures posted here should pertain to this actual demonstration. You are however encouraged to post your pictures to other relevant groups to increase awareness of this event. Members can post 15 things to the pool each day.